When dried and ground up, turmeric root produces a spice commonly used in Indian and Asian cooking. The knobby, orange-yellow root can be used fresh; when thinly sliced or chopped, it adds a slight yellow tinge to foods as well as a general sense of richness. Whether eaten cooked, raw or as a powder, turmeric root is rich in a number of nutrients. A 1-tablespoon serving of dried turmeric has only 29 calories per serving, less than 1 gram of protein and 0.31 gram of total fat. And it has 2.1 grams of dietary fiber, which means it provides 7 percent to 8.4 percent of the recommended intake per day. That's high given the very small serving size. In addition to containing a host of essential minerals and vitamins, turmeric also contains antioxidants that help fight inflammation. A 2011 animal study published in "Inflammation" found that turmeric supplements have stronger anti-inflammation properties than ginger does, potentially helping with the symptoms of rheumatoid arthritis. Using either powdered or fresh turmeric in dishes can provide you with the nutritional content and benefit of turmeric. While it is strong-tasting when consumed alone, turmeric, both ground and fresh, can be used in fresh juices and smoothies. If you are making juice or a smoothie in a blender, use powdered turmeric so that it blends in well with the other ingredients. For fresh turmeric, using a juicer is recommended as the fresh root can be tough and fibrous, making for an unpleasant texture otherwise. It isn't recommended to drink turmeric juice on its own because of its strong taste, but it is easily hidden by other sweeter ingredients in juices and smoothies. The warm, slightly spicy flavor of turmeric pairs well with hearty cooked dishes, in which both the powder and the fresh root can be used. Finely slice fresh turmeric root and add it to stews, soups and stir-fries, allowing the cooked root to be eaten whole. If you choose to use powdered turmeric, it lends itself well to seasonings for roasted vegetables and scrambled eggs, as well as marinades for meats. In some cases, chefs have even added turmeric to dough to make brightly colored bread with a slight spiciness and an added richness. Using turmeric as a tea is not the same as adding it to juices or smoothies because the taste is much more pronounced. Turmeric's spiciness means it can pair well with other spicy herbal teas, such as ginger. 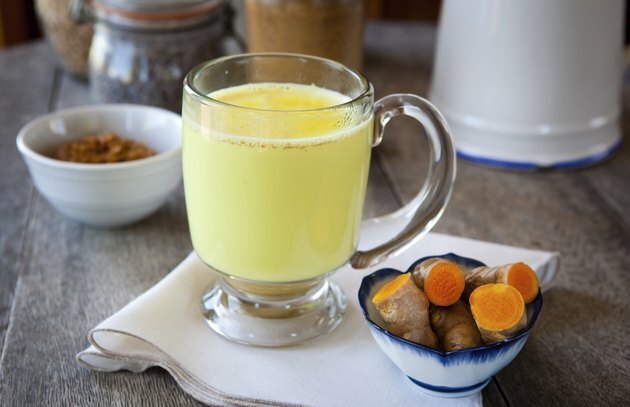 To make turmeric tea with only turmeric, add a 1/2 teaspoon of powdered turmeric or a 1/2 ounce of fresh, chopped root to 8 ounces of water. Bring the water to boil for 10 minutes. You can add milk or sugar to flavor the tea as you like. If you are using fresh root, strain the tea before drinking. Bon Appetit: How Restaurant Chefs Are Using Turmeric Accross the U.S.